Wherein our intrepid talk radio host interviews Senator Elizabeth Warren and comedian Roseanne Barr. Good morning listeners nationwide. Is it a good morning? We’ll soon find out. My guests today are Massachusetts Senator Elizabeth Warren and comedian Roseanne Barr. Hi ladies. 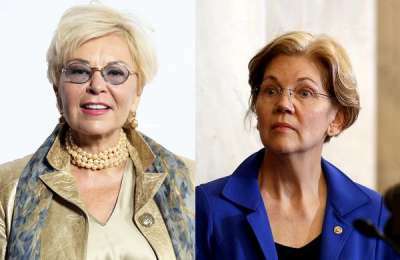 Comedian Roseanne Barr and Senator Elizabeth Warren. So many things going on in the White House. Let’s begin with chaos. Dozens of administration officials have been fired or resigned since Trump became president. Here’s just a few: Michael Flynn, James Comey, Reince Priebus, Steve Bannon, Rex Tillerson, Tom Price, Hope Hicks, Michael Cohen. The president is neurotic. He’s gotten rid of more people than I’ve flipped pancakes on a griddle. This puts the security of the United States at risk for our citizens and sends the wrong message to nations around the world. Can America be trusted? Change is good. Like I’ve been married four times. It takes awhile to get it right. I asked my last husband how many women he slept with. He said “Only you, darling. With the others I was awake.” It took years to get my head screwed on straight. Shut up, Senator. You want me to feel sorry for you because you’re a minority. We Trumpsters don’t believe in affirmative action. What do you mean by minority? You claim that you’re part Cherokee. That’s how you got into Rugrats Law School. Ain’t it? I got in because of excellent grades. And it’s Rutgers you numbskull. Well then I could have gotten a college scholarship. Growin up my ma used to tell me that I was a wild Indian. Let’s talk about Trump. He’s had four communication directors and three national security advisors in a year. Make that five communication directors. I might replace Sarah Huckleberry Sanders. I thought it was Huckabee. You don’t possess the skills nor the judgment. You sound like a hick. And why would Trump get rid of Sarah? He’s tired of watching her mouth move from side to side like a cow chewing when she speaks. You will be responsible for developing and promoting the agenda of the president in front of reporters in a daily briefing. Are you capable? Let’s do a practice run. I’ll show yas. Is Stormy Daniels a dark cloud over the president? I don’t know. You’ll have to call The Weather Channel. We learned today that the president was discussing firing Special Counsel Robert Mueller. If true, is this Mueller’s time? Hell, it’s always Miller time. Is it true one of the guests found your head in the toilet after a New Year’s Eve party? You mean you drank a fifth. Press conference over. I’m goin back to my day job. I’m leaving, too. I have a wrestling match with Jesse Ventura. Mr. Duncan, House Speaker John Boehner is in the hallway. Boehner staggers in the studio. It’s Jerry and you’re plastered. Why? Because I have a wine bottle sticking out of a paper bag? No. Because your pants are below your knees. I stole the bottle from some bum while he was sleeping. No other way for me to get through this interview, Kerry. Boehner takes a swig from the bottle and burps. 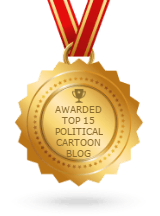 You are the 53rd Speaker of the House having served from 2011 to 2015. Prior to that you were in Congress for 21 years. Mind if I smoke? My fingers are twitching. Why not? Drink, smoke and be merry. It’s Jerry with a J. Do you know the difference between a magician and yourself? The hand is quicker than the eye? No. The magician returns your wallet at the end of the performance. You screwed the American taxpayer, fella. It’s Jerry, J-E-R-R-Y. You fought Obamacare leaving millions without health insurance and refused to bailout the country from W’s economic Wall Street and banking disaster in 2008. Hold on there. My drinking buddy Ted Kennedy and I co-sponsored the No Child Left Behind Act in 2001. I saved kids from being stupid. Helped overthrow Speaker of the House Newt Gingrich. He was the crook who stole your money, Perry. I’ll give you a lift home. See you tomorrow everyone.